According to the FDA (Food and Drugs Administration), pharmaceutical manufacturing has been well known for its inefficient and costly operations (2004). Recently, the need to increase efficiency and reliability has developed the necessity for improving the Quality by Design (QbD) of the solutions adopted by this traditional market. However, the main challenge for the pharmaceutical industry in moving towards cost-effective manufacturing is to design new operational procedures and workflows that comply with all regulatory requirements, but at the same time support continuous improvement by minimizing costs, time and resources needed (O'ROURKE & GREENE, 2006). Fedegari Group was chosen as the preferred supplier of contamination control systems for a multinational pharmaceutical company with a new sterile antibiotic powder plant. 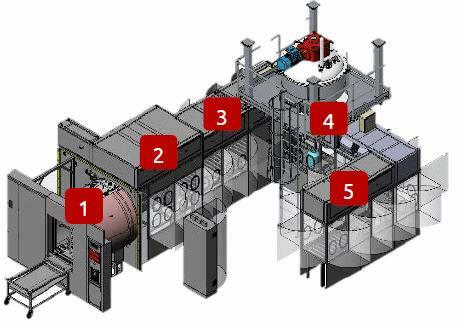 The requirements for the new pharma plant emphasized the need for Grade A continuity in the manufacturing process with a barrier between operator and sterile process. The main challenges of the customer were to optimize the powder filling process and benefit from the cost-effectiveness of process integration with the best ergonomic design for the operators as well as ensuring a reliable and safe pharmaceutical process. Fedegari Engineering Team has worked with the customer for developing the most efficient and reliable solution that would allow to fill the kegs in the safest way for the product and for the operators. The outcome is a complete plant that combines in a modular way various subsystems that have been individually tested by Fedegari for different applications thus minimizing the risks typically associated with novelties. The solution also represents the most compact design for this type of operations. Fedegari was choosen as the only manufacturer able to supply the process equipment (Washer-sterilizer) integrated with RABS and surface bio-decontamination with hydrogen peroxide MAL (Material Air-lock). A Washer-sterilizer integrated with RABS and surface bio-decontamination with H2O2 MAL applied to the powder dosing station. The washer unloads on module 2 – RABS. 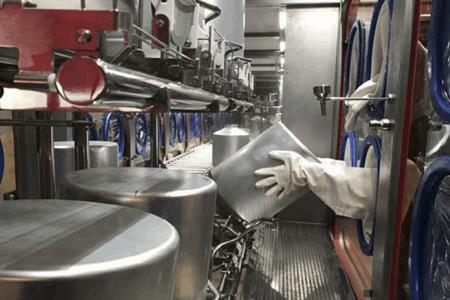 Module 4: Manual powder dosing, capping and bagging with automatic pneumatic lifting device. Packaging materials and tools are introduced through the H2O2 MAL connected to the module. Thema4 process controller delivered to the customer will be completely integrated with SCADA system. Applying Quality by Design (QbD), this solution helped the customer to achieve the desired ergonomic results on manual operations reducing the risks of contamination due to the integration of different machines connected by RABS into one unique system managed by a single process controller. Since continuous improvement requires a higher level of process understanding (FDA, 2004), Fedegari knowledge on pharmaceutical processes has been crucial to support pharmaceutical companies on the design of cost-effective solutions for process optimization and improved workflows. ERGONOMIC DESIGN - Unloading system designed to work at the same level (height) throughout all the modules - from washer to RABS. SIGNIFICANT TIME AND COST-SAVINGS by easily handling the kegs through sequential workflow inside the gloved isolator. COST-EFFECTIVENESS - Time and cost-savings on training and maintenance due to standardization of components, procedures and process controller.